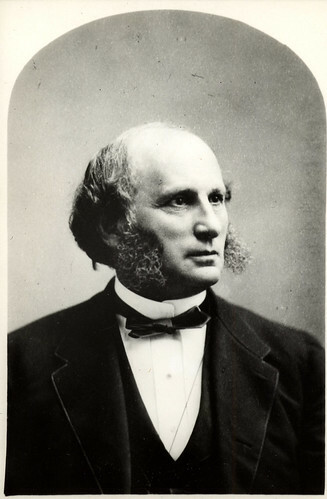 When President John Raymond died in the summer of 1878, Samuel L. Caldwell was asked to step in from the Board of Trustees to become the third president of Vassar. Caldwell was born in Newburyport, Massachusetts in 1820. After graduating from Waterville College (now Colby College) in 1839, Caldwell became the director of an academy at Hampton Hills, New Hampshire. He relocated to Newburyport shortly after, becoming headmaster of the West Grammar School, which he led for three years. Caldwell then entered Newton Theological Seminary. After graduating from the seminary in 1845, Caldwell dedicated himself to ministry, preaching in Baptist churches in Virginia, Maine, and Rhode Island for fifteen years. In 1858, Caldwell was appointed Professor of Church History at the Newton Theological Seminary. Caldwell’s tenure at Vassar marked the occasion for more alumnae involvement in Vassar administration. In April of 1884, ten alumnae wrote letters to the Board of Trustees expressing concern for the state of Vassar’s affairs and administration. The alumnae also accused Caldwell of not fostering relations between the college and preparatory schools in order to secure a larger and stronger student population. The Trustees were in agreement with this dissatisfaction. Caldwell resigned from the presidency in 1885, and J. Ryland Kendrick, another Baptist minister on the Board of Trustees, served as acting president until James Monroe Taylor was appointed president in 1886. Caldwell died in 1889. Although he was not an entirely successful president, the construction of the Vassar Brothers Laboratory, an up-to-date chemistry laboratory, is credited under his leadership. "Samuel L. Caldwell." National Cyclopedia of American Biography v. 5. New York: James T. White & Company, 1907. "Samuel L. Caldwell." Harper's Weekly 5 October 1878.